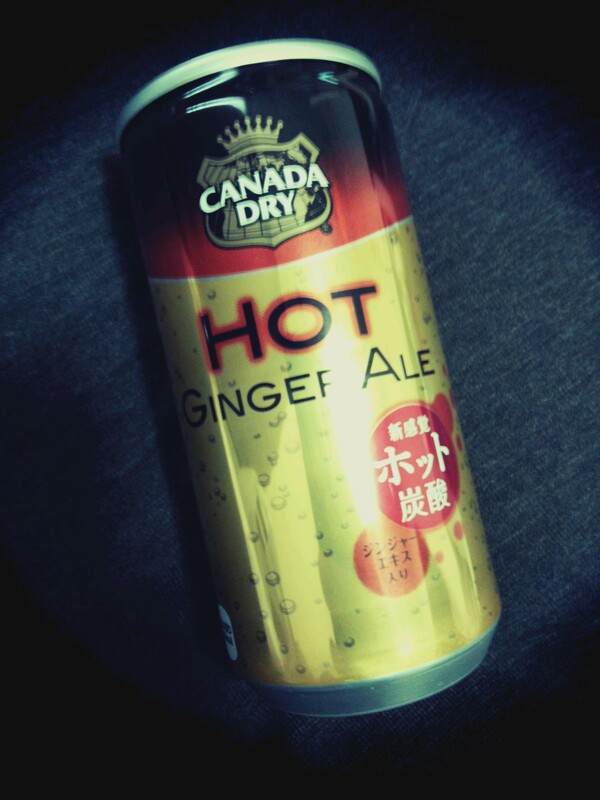 Hot Ginger Ale from Canada Dry. I nearly burned my hand holding the can while waiting in line. It tasted mostly like hot apple cider, although the carbonation was a little off-putting. I’d recommend you give it a try this winter if, like me, you don’t drink coffee. 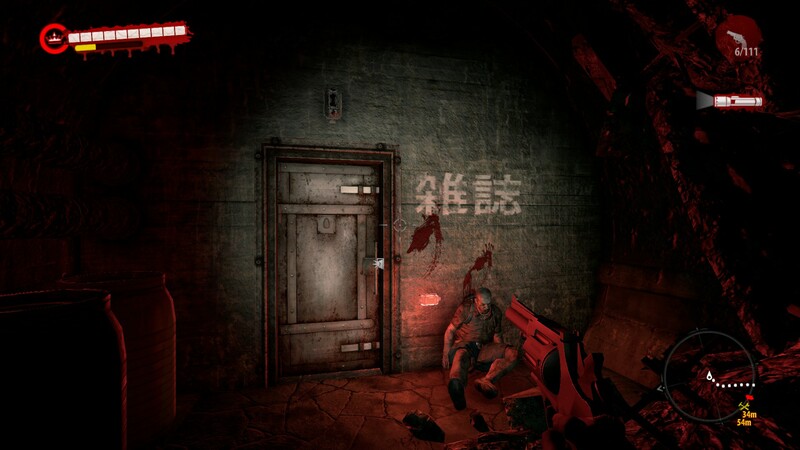 I was just playing Dead Island: Riptide, a zombie game which takes place on a tropical island, and in one section you have to travel through some tunnels dug by the Japanese in WWII. While there, I found this bunker labeled “雑誌”, which, while technically meaning “magazine” in English, more specifically and exclusively means the paper magazines people read. So unless this is supposed to be a room filled with old editions of TIME, the word they were looking for was “弾薬庫”, which means “magazine” in the sense of a storage depot for munitions. I suspect the developers flipped open the nearest Japanese dictionary and used the first entry they saw under “magazine”. Needless to say, I encourage people to always use a professional translator, no matter how small the job. Perhaps it is a testament to how well I make them, or perhaps to how “Westernized” (or at least “not very Japanese-like”) my girlfriend is, but I have gotten her hooked on PB&J sandwiches, This is remarkable in so much that Japanese people, at least the rare ones who have tried PB&J sandwiches, hate them (as do many Europeans, so I hear, but I have no means to verify this). I like to think that the reason most Japanese people do not like this American culinary tradition is because they have not had a good PB&J sandwich. I suspect that if they have had one, or attempted to make one on their own, they have used Japanese peanut cream and Japanese jelly. I once had some Japanese peanut cream that tasted likely the inside of a Reese’s Peanut Butter Cup, only creamier, and it was truly sublime, in a junk food kind of way. I have never been able to find it since, however, and every other variety of peanut cream I have tried has been a bizarre, translucent caramel-colored slime which tasted neither of peanuts nor butter nor the flavor of anything else I have tasted yet so far but, to describe it more succinctly in three words, is not good. 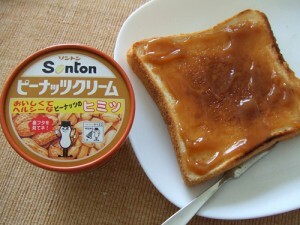 Of course, Japanese people, or at least some Japanese people, like peanut cream, or it would not be on sale. Human beings tend to like what they were fed as children, regardless of how people from other cultures may feel about it as adults. Still, I do not feel peanut cream is an adequate substitute for true peanut butter, which is generally available in Japanese supermarkets (usually only Skippy, the chunky type, luckily my favorite). American peanut butter is, however, very expensive, and I have heard Japanese complain that American peanut butter is too hard to spread and too sweet. As to the first criticism, I suspect they are putting it in the refrigerator, which of course would make it a bread-destroying nightmare. As to the second, I don’t know where this is coming from; in my experience, Japanese peanut cream is far sweeter than Skippy peanut butter. The other essential half of the PB&J equation is the “J”, which most people take as “jelly”, but I far prefer jam. This, again, is where I suspect the scant few Japanese who have tried PB&J sandwiches (and didn’t like them) have gone wrong. Even American jelly is an oversweet sludge far distanced from its fruity roots, and Japanese jelly doubly so. Here in Japan, I use an imported French jam with no sugar added from the local import shop. If I were in America, I wouldn’t dream of being such a snob and buying such an expensive jam, but so far it is just about the only real jam I have been able to find, and, thanks to the no added sugar, is not too sweet. I also almost always use raspberry, both because it’s my favorite fruit and because it balances well with the slight saltiness of the peanut butter without overpowering it. This, anyway, is the recipe I use when making PB&J sandwiches for my girlfriend (Skippy chunky peanut butter and no sugar added raspberry jam), and she can’t get enough of them. On October 23, 1964, during the Tokyo Olympics, Japan and the Soviet Union contended for gold in women’s volleyball. In a stunning victory, Japan won 3-0 in a match which still retains the highest ratings for a sports program in Japanese history at 66.8%. The Western press referred to the slightly-built but skillful Japanese team as the Witches of the Orient. Although broadcast by NHK, it was standard practice at the time to re-record over the expensive tapes used to record television programming, and it was long thought that nothing but highlights of the match remained. Recently, however, NHK has discovered a sports lover in possession of recordings that had been broadcast live overseas during the match. The match will now be broadcast for the first time in full since the Tokyo Olympics on BS1 on January 2, 9 p.m.
Today I’ll give you a three-fer of Japanese soft drinks. 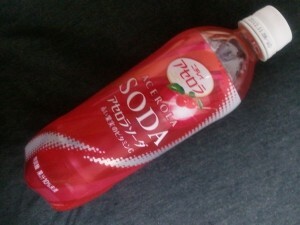 The first is this Acerola Soda, of which I’m quite fond. Acerola is berry, similar to a cherry, which contains the highest amount of vitamin C of any fruit known. Vitamin C content is also a marketing point of this soda. The taste is somewhere in between cherry and watermelon. 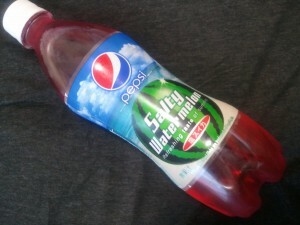 Next is the new Pepsi flavor for this summer, Salty Watermelon. Pepsi makes a new flavor every summer. In fact, by this point, Salty Watermelon is probably already gone. Japanese food makers love their limited time items, although it makes little sense to me – developing new products takes quite a bit of money, and with the vast majority of limited time items only being sold for a handful of months, often in limited territories, I wonder if they’re making back what they invested. But, anyway, Salty Watermelon soda. Actually, its a very appropriate flavor for a summer-themed drink in Japan. In Japan, its quite common to sprinkle a small amount of salt on watermelon, which contrary to expectations actually make it taste sweeter (this fact is now being picked up in some “life hack” articles). So although it sounds strange now, in a decade or so, it may seem perfectly normal. The taste wasn’t bad, which was surprising to me as I don’t like watermelon in the first place. It was basically as the name described – your standard artificial watermelon flavor with a hint of salt. Actually, it was a lot like a sports drink, which contain salt to help replenish sodium lost during exercise. 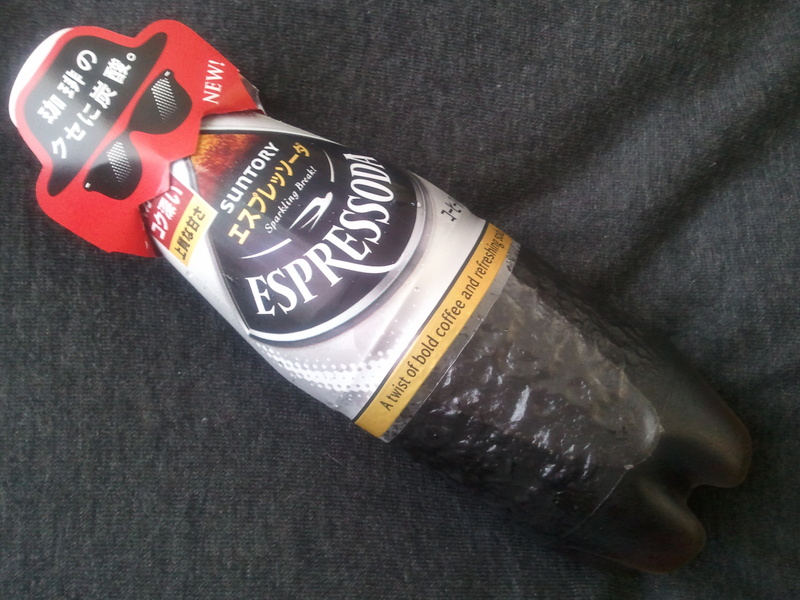 Last up is Espressoda, an espresso-flavored soda which tasted absolutely awful to me – but then, I don’t like coffee. My girlfriend described it as tasting like a carbonated coffee candy drop. She felt it was far too sweet. Eventually, after sitting in the fridge for several days, she turned it into coffee-flavored jello which she liked much better. Summer is the season for new Japanese soft drinks, with quite a few seemingly just spit-balling, such as the eel-based soda from a few years ago. Today I give you 三代目米づくり (Sandaime-komezukuri, roughly, “third-generation rice cultivation”). 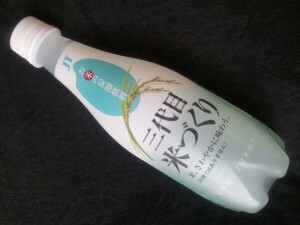 As the name indicates, it’s a rice-based carbonated beverage produced by Japan Tobacco, which makes a surprising number of drinks for a tobacco company. In addition to saccharified rice flour, it’s made with sweetened condensed milk, giving it a flavor similar to Calpis, which to me tastes like crushed-up Smarties melted in water. Take that as you will. *First, let it be duly noted that I am not a tax accountant or any sort of legal authority. All information provided below is for reference only. Please be sure to confirm the appropriateness of any and all actions you may take based on the information provided here with an appropriate authority. While I have heard and read about what one should do, legally speaking, when becoming a freelance translator in other countries, I have not yet seen anything that covers becoming a freelance translator (or any other kind of freelancer) in Japan. In fact, it is exceedingly simple and painless. All you are required to do is file a single document, 個人事業の開業・廃業等届出書 (available here) with your local tax office (税務署; find the one nearest you here) declaring that you are starting your own business. There is no need to obtain a business license, tax number, etc. Actually, like many laws in Japan, although you are “required” to file this document, there are no punishments for failing to do so. However, 1) you should do it because you are a good citizen, 2) it’s incredibly easy to file (see below), and 3) filing it enables you to enter the money you earn translating as business income (営業所得) on your tax return rather than as miscellaneous income (雑所得扱). It’s also required if you want to file the fabled blue tax return (青色申告), which offers all sorts of benefits for business owners but looks to be a real pain to file, so I’m not bothering with it for now (learn more from this pamphlet here). You’re also supposed to file it within one month of starting your business but, again, there are no punishments for filing it later than this. Click to view large version. 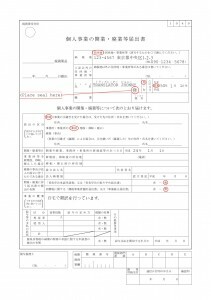 Anyway, as I said, filing the 個人事業の開業・廃業等届出書 is easy. The following instructions assume you are (or will be) a freelance translator operating out of your home and have no employees. I’ve provided an example form on the right. Click to enlarge. 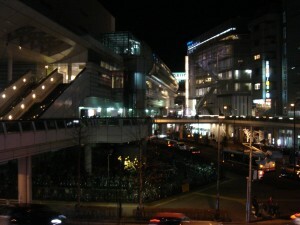 In the 届出の区分 section, circle 開業 at the top. The address line below that is only used when you move, so there’s no need to fill that in (conversely, should you move, you have to refile this document with your new address; you also have to file it again should you stop your work as a freelance translator and “close” your business, hence the 廃業 part). Below the address line, circle 新設 to indicate that you are opening a new office. Skip down four sections to the section called 開業・廃業に従う届出書の提出の有無. 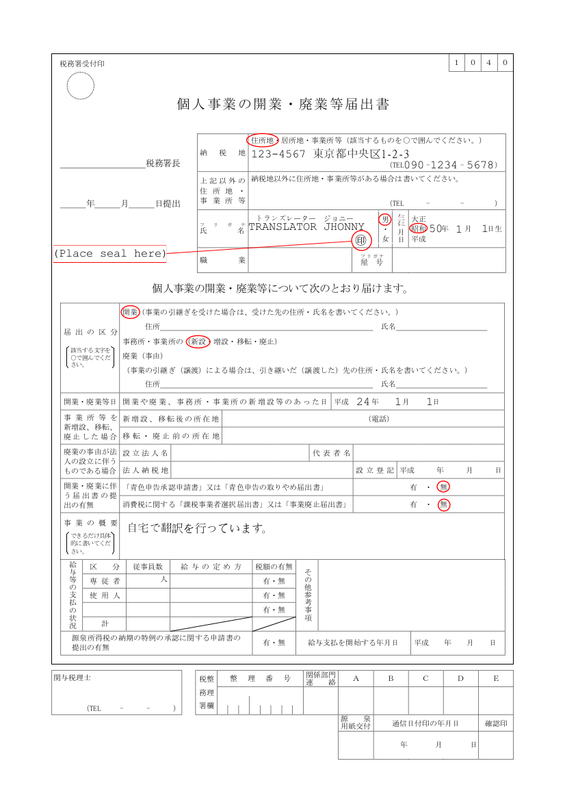 There are two sub-sections here: 「青色申告承認申請書」又は「青色申告の取りやめる届出書, which concerns the application to use the blue tax return; and 消費税に関する「課税事業者選択届出書」又は「事業廃止届出書」, which is for consumption tax exempt businesses that wish to be taxed regularly. For both subsections, circle 無 (unless you want to do the whole blue tax return thing, in which case, consult with a staff member at the tax office first). Lastly, in the 事業の概要 section, write “自宅で翻訳を行っています。.” That’s it! Now all you have to do is give it to one of the staff at the main reception desk in your local tax office. They’ll stamp it and probably offer to give you a copy, as well. They won’t even ask to see your ID or visa status. There’s also no need to confirm anything – you’re all done! Just don’t forget to keep records of all your income and business expenses and file your tax return on time. HR consulting firm Mercer recently released their 2012 cost of living ranking for cities, and the “city” of Tokyo is ranked as the most expensive city to live in in the world. Of course, the survey is based on the cost of living for a (Western) expat who likes his Western-style comforts, making comparisons with Western nations rather fuzzy, but fair enough. The real problem here is that Tokyo is not a city. Tokyo is a prefecture – a state/province/administrative district encompassing several cities. True, a city called Tokyo once existed, but it was merged with the prefecture of Tokyo in 1943. So what, exactly, does Mercer mean when it says Tokyo is the most expensive city to live in in the World? Perhaps they are referring to the 23 special wards of Tokyo, which occupy the area where the old city of Tokyo existed and which are basically administered as independent cities. Even so – which one? The lack of due diligence on the part of foreign media on this most basic of facts is astonishing. 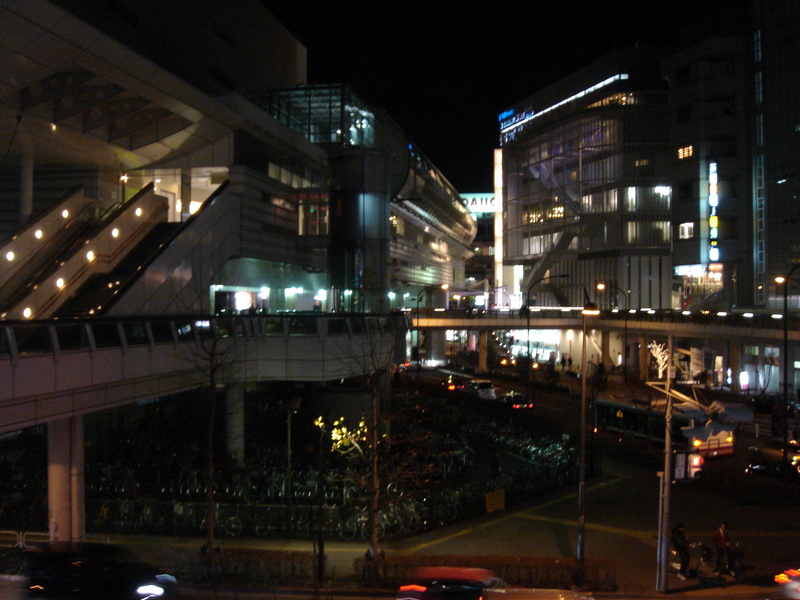 Even articles which acknowledge the existence Tokyo’s wards, such as this one, still refer to Tokyo as a city. For the last time, Tokyo is not a city and has not been one for 69 years and counting.